The other morning I struggled to get out of bed for a fishing trip. It's not like me - I generally have no trouble but I was late to bed, it had been a warm humid night and I didn't sleep all that well. Anyway when I woke up it was drizzling and mild with no wind so I put on the gear and drove to the coast. Needless to say I was the only idiot there and I was a little bit later than I would have liked. 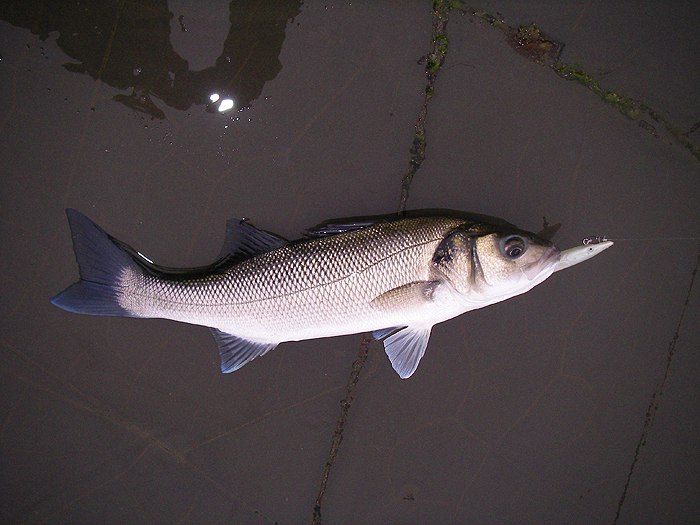 It was a neap tide and about half-ebb so I paddled into the shallow water to get a better angle on my casts and began fishing.For perhaps fifteen minutes nothing (I was using an 18cm Pearl Evo Redgill because there was no weed and the sea was calm and slightly coloured) then I felt a tap. I was certain it was a fish so the next cast was made to the same spot with some optimism. Sure enough I had another bite, a bit stronger, but again I missed it. 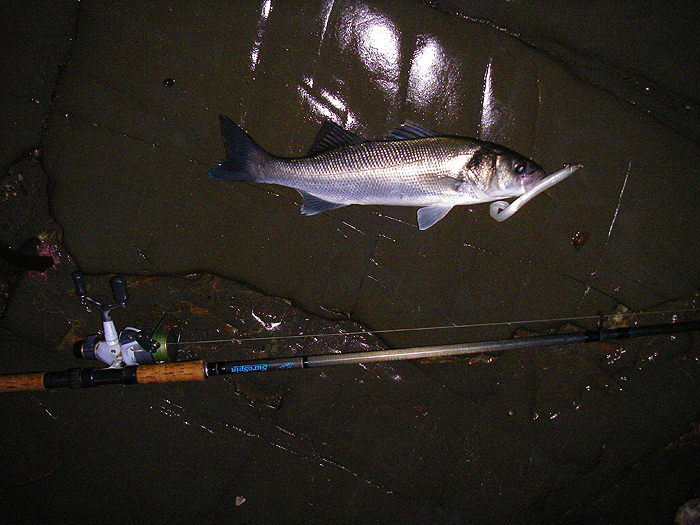 The third chuck resulted in a firmly hooked fish which I played in, slid ashore and photographed before returning. It was no monster but it's always nice to get one. After catching and photographing another fish I hung the camera round my neck and slipped the pliers (for unhooking) into my jacket pocket so I wouldn't have to fetch them from up the beach (where I'd left my bag) next time. 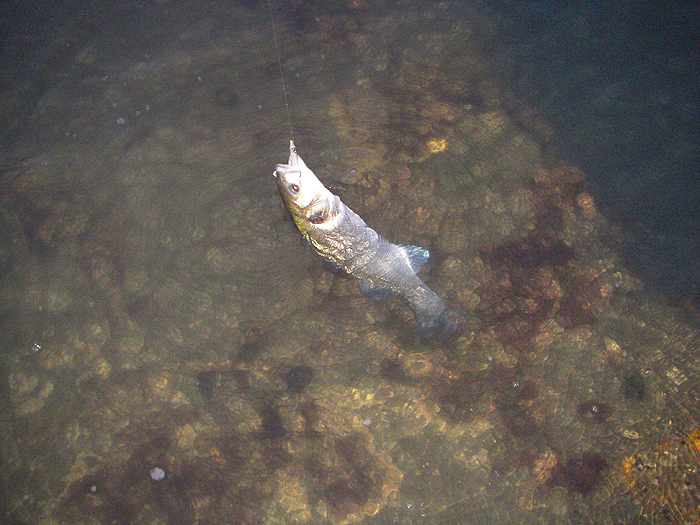 After a few more casts I had a third bass - it was looking promising. For the next hour-and-a-quarter I flogged away and every few minutes I had another fish. 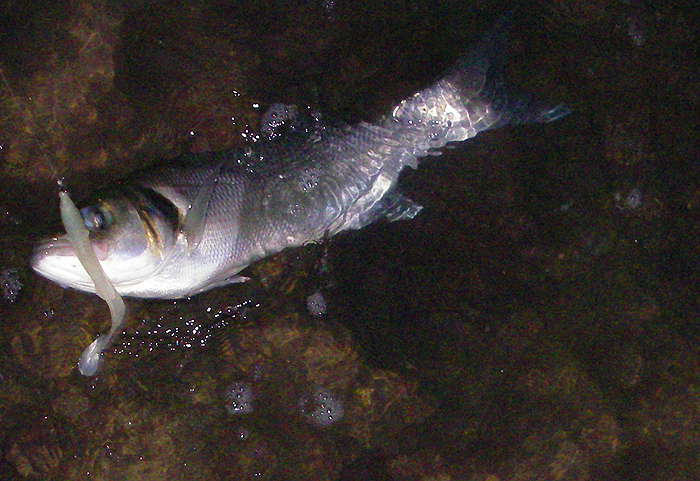 The bites typically came in groups with lulls of perhaps eight or ten biteless casts in between. Before I packed in to go for my breakfast I landed thirteen bass. All were smallish fish with the best perhaps three pounds but, for some reason, they fought like tigers. I mostly unhooked them in the water by grabbing the hook with my pliers. All in all a very pleasant fishing trip and a nice change from catching sea trout in the river. I think that a couple of my pals went down the following morning and had only the odd fish between them - that's fishing! Glad I went when I did.